There’s something amazing, almost impossible-to-attain-wonderful about being able to conk out for the duration of a flight. Most people desperately want to fall asleep, but all kinds of obstacles stand in the path towards the blissful REM stage: screaming children, turbulence, intercom interruptions, an especially chatty seatmate, plain old stress, and anxiety. There’s a whole lot of common-sense advice floating around about how to best trick your body into forgetting flying is miserable. Don’t drink caffeine if you’re a caffeine-sensitive human, cram in some ear plugs, slap on a neck pillow, imitate night with an eye mask, down some Dramamine, do the counterintuitive and splurge for an expensive ticket. But there are some overseen factors. We’ve outlined a few below. For one, wearing comfy clothes seems to help get you to nod off. If you’re constantly worried about your jeans popping off and are squirming, say goodbye to any winks. Leggings or sweats? It’s practically a pajama party! Not only will your stretchy holiday pants help to ease swelling from the pressurization of the cabin, it can help trick your mind into thinking it’s time for a nap, getting you a bit sleepier than you might have otherwise been. Speaking of pressurization, maybe consider skipping salty snacks for the duration of the flight. Accept the tiny and precious packets of pretzels or chips or peanuts to your heart’s content! Just save them for later. Noshing on something like a granola bar or yogurt instead might be more conducive to snoozing. If the window seat helps you angle your head onto something that’s not a human, nab a Seat Alerts account to up your odds of getting a (relatively) choice cabin assignment. Most airplanes have zero percent humidity in the cabin (water separators help avoid icing in the plumbing), though some newer models like the Boeing 787 have humidified cabins. Staying hydrated should make you at least a little more comfortable, though of course you shouldn’t drink so much that you constantly have to sneak past your seatmates awkwardly for a trip to the restroom to pee. Stash an empty bottle through security and just fill it on the other side to avoid upping your carbon footprint and/or paying something horrendous for a fresh one. This tip is courtesy of my uncle, who happens to be a long-time pilot for United Airlines and therefore spends a lot of time flying. Basically, don’t cross your arms and legs. Not doing so means there’s less of a chance they’ll fall asleep and wake you with that weird tingly feeling. If you’re crunching up to preserve heat, just ask for a blanket or wrap yourself instead. Another tip from that trusty uncle spending his days in the air. Audio meditation files can be helpful here. Classical music can help you get in the zone. Whatever it is, maybe avoid the heavy metal or peppy pop — the goal isn’t to kick your workout up a notch, it’s to get you in a sort of zen place, and soothing sounds are what you’re aiming for. This one might seem off, but hear us out. Dramamine is a popular pick to both knock you out and combat motion sickness, but there’s a good chance its effects will outlast the actual length of your flight. Unless you’re traveling for upwards of six hours or so, it’s actually way too much. What you should do instead is get something that knocks you out for just the right amount of time. If you’re of the over-the-counter persuasion, make sure you read the fine print and get something short-acting. A substitute like melatonin or a small dose of the ever-popular Ambien might work better. Some people find these options don’t leave them zonked post-flight the way Dramamine does. Loads of airlines will give you those mini liquor bottles for free if the flight is long enough. And we get it, it’s tempting to get tipsy to the blissful point of sleepiness. We’ve got some bad news, though: A little alcohol can help you fall asleep, but won’t necessarily help you stay asleep. Mixing any pharmaceutical sleeping aids with alcohol is a Bad Idea™. (Ditto the caffeine, though there’s some evidence the coffee nap might be a great way to snag a few winks if you’re aiming for a nap and not outright passing out on your flight.) Keep the alcohol intake low and load up on the water instead (see above). 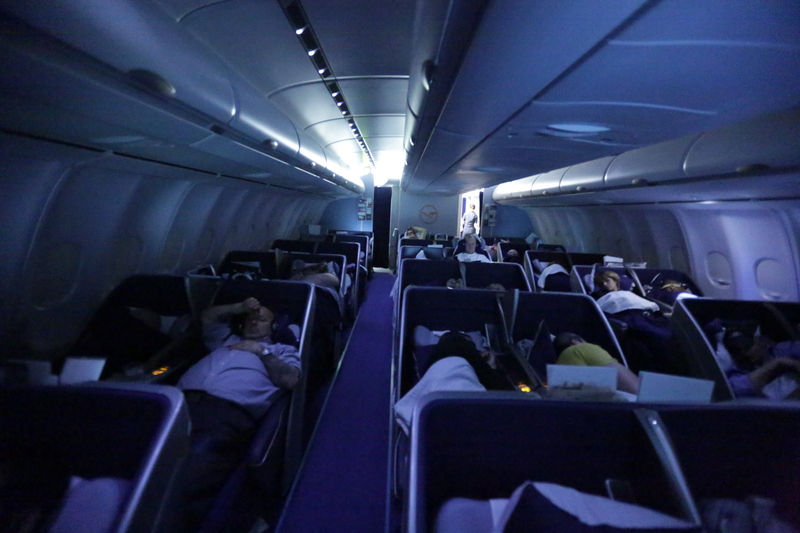 We get it: Sleep is hard, whether you’re in the air or on the ground. But using science to your advantage and listening to a soothing oration of a nature documentary might finally earn you the blissful experience of sleeping in-flight.